What is the Vuze camera? 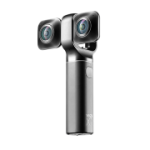 The Vuze Camera is a small and easy to use 3D 360 video and stills camera. Oh, and yes it also creates 2D 360 videos and images. 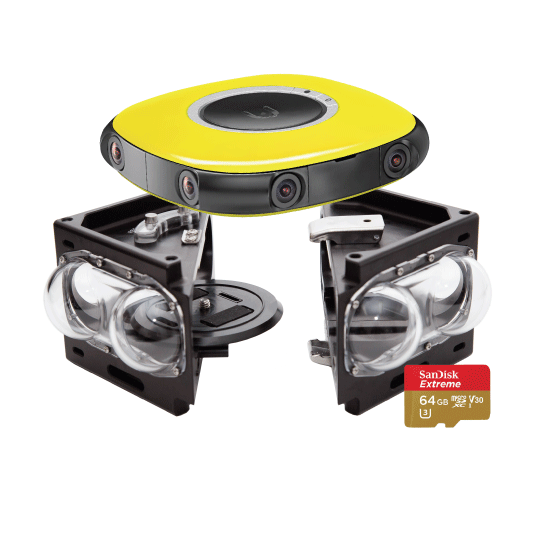 360 means you capture all and everything around you, the whole 360 by 180 degrees’ sphere. 3D means that you have a feeling of depth, which gives you a sense of presence in the scene you are watching. This works exactly the same way as we humans see with our two eyes in real life. Where is the footage stored? Anything you shoot with Vuze camera is stored on a removable SD memory card. Is an SD card included with the camera? If so, how big? The SD card is not included with the camera. For storage of one hour of video footage captured with the camera you will need about 64GB. Its 1GB for 1 minute video. What type of SD card can I use? We have tested several micro sd cards that can work with the Vuze camera. When recording 120MB bit rate we recommend to use UHS-III (U3) – Ultra High Speed Class with U3 Speed Class Mark. When recording 80MB bit rate we recommend to use UHS-I (U1) – Ultra High Speed Class with U1 Speed Class Mark. We recommend using the maximum bit rate speed when recording and therefore use U3 microSD card type. How long can my video be? Video capture length depends on the battery life and the memory. 64GB of data make for 1 hour of video. The camera internal battery can operate for about two hours. Can Vuze camera do live streaming of 3D 360 video? Vuze+ camera’s can live stream when connected to the PC, via the Vuze LIVE software. Vuze camera’s can also live stream if an independent LIVE license is purchased. How quickly can I watch my 360 video after I captured it? You will need to import your video from Vuze camera to Humaneyes VR Studio on your computer and render it to your desired output. During the render process, the videos are stitched and 3D 360 video is generated. The VR video processing rate is close to 1 minute per 1 minute, using the recommended hardware configuration. How long can the camera operate between recharges and how long does it take to charge it? The camera can operate up to 2 hours before it needs to be recharged. Full charging takes approximately 3 hours. Using external power source camera can work indefinitely. Yes, it records audio. The camera is equipped with four MEMS 48Hz microphones producing four ACC audio tracks. You will be able to edit your audio later. Does the camera have a remote control? Yes, the Vuze camera comes with a mobile app, which serves as a remote control. You can remotely switch the camera on and off, start and end recording. You can also preview the scene before shooting. Can the camera shoot in motion, or must it be static? The camera shoots in any situation: static on any standard tripod or holding it in your hand, walking and holding it, attached to a helmet, or to a bicycle handlebar. Anytime anywhere. Can the Vuze Camera be used underwater? Yes it can, using a special waterproof case. 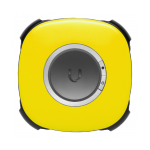 You can purchase the Vuze underwater kit here. Does the camera have blind spots? It covers the full 360 x 180 degrees sphere, while within the distance of 30-50 cm around the camera, some objects might be missed. Where can I buy the Vuze Camera? When can I expect to get my Vuze Camera? Shipment takes up to 14 days. As with any video camera, it’s best to shoot in good lighting conditions, and without drastic changes in light all around. This kind of environment will give you the best results. In other conditions, there might be a slight quality reduction. It is recommended that objects around the camera should be about 3-4 feet away. For closer objects, some stitch lines may be visible. It’s best to keep the camera as steady as you can. Strong vibrations and shaking may damage the quality of stitching and the end experience. In our showroom you can see content captured with the Vuze Camera. Many of the featured videos were captured with earlier prototypes of the camera and we are updating exciting new content as it becomes available. For information about viewing Vuze Showroom content see www.vuze.camera/showroom/about. You can download and view Vuze videos on any headset device, with a VR compatible player. 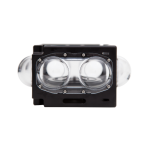 Vuze videos are in 3D Top-Bottom format, which is supported by most common VR players. 360 3D videos can be uploaded to Youtube, Facebook, Vimeo, VeeR and many other platforms. You can upload your content from Vuze VR Studio to these platforms as usual and it will be recognized as 360 and 3D automatically. I am a content creator and I wish to partner up with Vuze to create awesome 3D 360 footage with Vuze. Sign up on our website to be kept up to date about our progress. Contact Us to be included in the list of interested content partners. I am a distributor and I wish to sell the Vuze Camera in my area. Contact us to be included in the list of interested distributors. Contact us to be included in the list of review/demo unit requests. Please contact us so we can set up the interview and/or refer you to our PR representatives. You can also download our press kit. 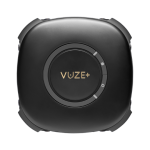 I want to write about Vuze Camera. Do you have a press kit? Yes we do. You can download it here.